Both the brother in laws came to the conclusion that with bag full of money in hand and selling themselves to be the champions of the August revolutionary uprising they would be able to capture the state power easily by organizing a political party absolutely under control. And if the funding is stoped then PROGOSH would have a premature death. As a result, rest of us would be forced to do politics ad their henchmen. This is how they would ensure their leadership position in the party. A ridiculous, childish thought and expectation! However, one day both sat down with us to discuss the proposal of Gen. Ershad and their decision. After listning everything we asked what would happen to PROGOSH? As Gen. Ershad is providing the opportunity to do open politics we should stop persuing underground politics. They would float a new open political party named Freedom Party(FP) and PROGOSH should merge with Freedom Party. But when the organizational activities of PROGOSH is progressing rapidly at that point of time if you float another party that would create cofusion within the party and many questions would be raised. It might be difficult to answer the questions raised by the experienced politicians who had decided to do politics with us believing in our motive, aim, political ideology and party manifesto, not for any greed. Still remains lot to be said. The way Gen. Ershad has usurped power on gun point, whether Faruk should participate in the Presidential election or not to provide him legitimacy that too should depend on the decision of the Presidium of PROGOSH. Only the decision of you two may not be agreeable to the majority leaders of the party at the highest level. Besides, we all are fully aware about the miserable consequences that Ex-President Mushtaq and his party had to face right from the start when he embarked on open politics trusting Gen. Zia, the champion of democracy. If we and the Freedom Party also face such consequences then what would be our position? Have you thought about that? We had already conveyed our decision to Gen. Ershad. In view of that whoever would agree with our decision we shall go along with them. Those who would differ they have to think what they would be doing. That means, so long it has been known to all that we are together but now you want to reveal that we are not together. Such devisiveness would prove detrimental to all of us in future. You should have thought about this. Before giving your words to Gen. Ershad both of you should have discussed this matter at least with us. We had taken the initiative to organize PROGOSH after an unanimous decision. What would you say about that? Then this oppurtunity was not there. Now, as the oppurtunity has come it wouldn’t be right to let it go out of hand that’s why we have given our words to Gen. Ershad. One has to be pragmatic in politics. Certainly, but that should be done according to the party manifesto. We had said all that we wanted now you all have to think what you should be doing and inform us your decision. One has to be pragmatic in politics. It was evedently clear from their conversation that they would stick to their decision. Their such decision created a serious crisis for us. All of us could understand it would not be possible to carry forward the organizational activities of PROGOSH any longer due to scarcity of fund. Therefore, Shahriar and Huda must slow down their party works. The leaders and the workers have to be informed the reason. They would be told that the dictator Ershad to earn legitimacy to his unlawfull take over has offered the opportunity to Col. Rashid and Col. Faruk to participate in open politics and both of them have decided to accept his offer without consulting any one of us. Most of the leaders of August revolution had differed with them so they would be launching a new party shortly. Under this circumstances, the Presidium of PROGOSH may decide whether PROGOSH should merge with the newly formed party or not. The Presidium decided that PROGOSH would remain underground maintaining its self identity and continue its activities as before. Simulteniously, decision was taken that PROGOSH would have no relation whatsoever with Ershad the dictator. If the present flow of funding is stoped then PROGOSH would move ahead at a speed permited by its self generated financial streanth. But in the mean time a tactial move has to be taken so that Col. Rashid and Col. Faruk can’t do anything untowards tarnishing image of the differing leaders of the August revolution. This was a very significant decision taken by the Presidium. The decision was that Maj. Huda would join Freedom Party first followed by Col. Shahriar to keep both the brother in laws under control. In the Presidential election Gen. Ershad won with the support of Awami League. Pir Hafez Ji Huzur became second and Col. Faruk secured third position. In the Parliamentary election Gen. Ershad’s Jatiyo Party got the majority seats. Freedom Party won two seats, Maj. Bazlul Huda(Secretary General of freedom Party) and Mr. Mannan, ealder brother of Col. Rashid. BNP boycotted both the elections. Awami League and Jammat e Islami participated in the election. Jamaat failed to win any seat. Sheikh Hasina graced the seat as leader of the opposition in the Parliament. This is how with the support of Awami league Gen. Ershad the Indian agent who took over power at the gun point managed to enjoy state power as an elected President shrouded with the cloak of democracy. He hijacked the politics introduced by Gen. Zia and started ruling the state in similar way. As a result, corruption, nepotism, misrule, exploitation, oppression spread like cancer at every tire of the society right from the grass root up to state level. Thus the national politics had become thoroughly polluted and corrupted. The condition of BNP the party founded by gen. Zia then under the leadership of Begum Khaleda Zia was very pathetic and precarious under pressure and durace from both Ershad and Hasina. At that time Khaleda Zia, the house wife virtually had nothing to do but looking after the empty cage deserted by the opportunist doves. Every day she used sit at her emplty party office surrounded by a few young leaders and workers of Jubo Dal and Chatra Dal killing flies hovering around the table. It is worthwhile to mention the names who stood by her in those rainy days were Goyeshar Roy, Sayeed, Bulu, Alal, Rizvi, Tariqul and Khoka. Most of the senior leaders like Bodruddoza Choudhury and Col. Oli Ahmed and others seldom visited the party office. But inactivity of Khaleda Zia and BNP could not cow down the conscious people. Gradually the fellow countrymen started raising their voice against the despotic and dictatorial regime of Gen. Ershad. Anti Ershad movement was gaining streanth all over the country with spontaneous participation of the enraged people. President Gen. Ershad and his party’s popularity was eroding rapidly. At that juncture all the nationalists and beleavers in religious values and commoners across the land had looked towards Khaleda Zia to come forward to organize and lead a mass movement politically against Ershad encashing the anti Ershad sentiment of the people. That expectation gave a new life to inactive BNP and through the anti Ershad movement Khaleda Zia emerged as ‘Desh Netri’(Leader of the Country). In 1986, when President Gen. Ershad was preparing for the election at that time, largest two political parties Awami League and BNP came to an understanding that they would not participate in any election under Gen. Ershad. But just before the election, after enjoying a secret long drive with Gen. Ershad Sheikh Hasina on return stunning the entire nation had declared that Awami League would be participating in the forthcoming election! And she did so stabbing at the back of the mass movement against Ershad. Jaamat e Islami had also participated in the election following Awami League. Khaleda Zia the supreme leader of BNP remained steadfast and had boycotted the election. Thus, Khaleda Zia earned the image of an uncompromising leader in the eyes of the people. It is being said that during the long drive Gen. Ershad had given Hasina TK.17 Crores for her decision to participate in the election. 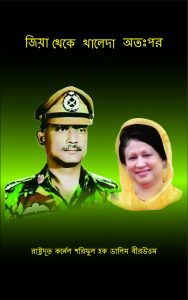 Khaleda Zia was becoming more and more popular as the anti Ershad movement was getting intensified with each passing day. The stage managed election of ‘A’ and ‘B’ teams supported by India added new hight to anti Ershad mass movement. Insecured people were pushed to the wall and had became desperate to oust the dictator from power due to total break down of law order situation, alerming crisis in the economic sector due to wanton corruption, sky rocketing hike in the prices of daily necessities, state terrorism, countless loss of lives of innocent peace loving people including Dr. Milon, Jail, persicution, unnecessary harassment, instability, uncertainity of life and the future. Ershad movement. This decision was taken to save the very existence of Awami League as a party. Jamaat had followed Awami League. Ershad was made to realize that this move was necessary to continue their game. He was also assured as long as he would be toeing their line no harm would be done to him. Surprisingly, being the undisputed supreme leader of the on going movement Khaleda Zia failed to catch the bluff and warmly accepted Hasina as her ally. The politics of Bangladesh is very strange indeed! When the torrential tide of the movement paralyse any country then every dictator become insane! So was Gen. Ershad. He decided to arrest Khaleda Zia and warrent of arrest was issued. But his mentor India Chanakyas made him understand that if only Khaleda was put behind the bars then Hasina and her Awami League would becom totally isolated from the people so, warrent of arrest needs to be issued against the both. But the main target of the steam rollar of state terrorism should be Khaleda Zia, her BNP and other leaders and workers of her allied parties and like minded organisazions. This is how India managed to keep it’s pawn Hasina active in the playing feild for future. As dicteted most obediently Presidemt Ershad ordered to issue warrant of arrest against both Khaleda and Hasina. Soon after the issuance the warrent of arrest Khaleda Zia was forced to go under ground. But this decision of Gen. Ershad was a boomerang against him. The mass monement turned into a people’s upsurge. At that crucial juncture, Begum khaleda Zia and all other leaders of her combine gauging the haterate and anti Ershad sentiment of the people decided to assemble sea of people at Dhaka to siege the cantonment to force President Ershad to abdicate from power. ‘Siege the Cantonment’ programe was announced accordingly. Taking the opportunity of that announcement President Ershad to save himself and to retain his power decided to use his last weapon, to declare Martial Law in the country instigated by his cronies. Those who had encouraged him the most to take such a disastrous decision were, Gen. Atik, Gen. Sadek, Gen. Abdur Rahman, Gen. Mannaf, Gen. Nuruddin, Gen. Shawkat, Gen. Mustached Salam, Gen. Mahmudul Hasan, Brig. Nasim, Brig. Mahmud, Brig. Waheed, Brig. Rafiq, Brig. A M S A Amin, Brig. Hafeez, Col. Malek, Col. Ashraf and Col. Naser. Most of them were repatriated officers. Such a decision would mean pitting the armed forces directly against the people. A civil war would start. Armed forces including all other law enforcing forces would get divided. If the situation goes out of control then President could easily seek help from India under the 25 years treaty of friendship and co-operation, signed between Mujib and Indira still in place. That sought for opportunity would be eagerly accepted by India. The mighty Indian forces would march in from all side. It wouldn’t be impossible to resist that vigorous aggression. After moving in it would not take too long to dispose off their interim pawn Gen. Ershad and crush the people’s upsurge. The NEO-BAKSHALITES under the leadership of Hasina would be brought to power. With the connivance of her government all the nationalists and believers in religious values whatever is left over would be widded out from the vital institutions of the state structure armed forces including all other law enforcing forces and egencies, political arena and every segment of the society. At the same time, all the forces and agencies would be reorganized as the repressive tools of Awami League very carefully to annihilate the opposition. Thus, Bangladesh would become a client state. The nation with Muslim majority would again be enslaved by the Hindus for indefinite period of time. This how the long drawn blue print of Indian Chanakyas that was formulated in ’71 would be materialized. This can’t ever be accepted by any conscience patriot and a genuine freedom fighter. This is why when Brig. Khaled and Col. Shaffayt jamil being pawns in the hands of India staged an anti national reactionary putch on 2-3ed November’75, we had left the country as a well thought of tactical move though at that time we had enough sreanth to counter them in every way. The exposed leaders of Sena Parishad could manage to organize the historic victorious Sipahi and People’s revolutionary uprising on the 7th November. Col. Taher’s Biplobi Shoinik Sangstha joined Sena Parishad as an ally. Detailed planning was worked out in this regard in a closed door meeting with Col. Taher at the Banga Bhaban before our departure. I had written about this meeting at leanth in my earlier published book Ja Dekhechi, Ja Bujhechi, Ja Korechi. In English the Untold Facts. It might not be possible for the readers to procure this book at present but they can down load it from the two web sites addresses given below if desired. Not to provide any such opportunity, despite of extremely abominable treachery of Gen. Zia, the Sena Parisad, its leaders and workers did not go for any confrontation and had accepted self exiled life temporarily for the greater interst of the country and the nation. Because, they all were dedicated patriots above all expectations and gains. They were never power mongers only for power sake. Their aim was that the people should be empowered to build in true sense an independent, self relient progressive, prosperous and happy Bangladesh based on justice, equality and fraternity. This dream shall be cherished in the heart till the last breath.